Welcome to Azhdarchid Paleobiology, a blog produced to accompany the PLoS ONE paper ‘A reappraisal of azhdarchid pterosaur functional morphology and paleoecology’ by Mark P. Witton and Darren Naish (both of University of Portsmouth): this paper is freely available online here. All text and diagrams provided here should be regarded as freely available for use, but images must be credited to Mark Witton/University of Portsmouth, and cannot be used commercially. Pterosaurs are flying reptiles that lived during the age of the dinosaurs (between about 230 and 65 million years ago). Although often called dinosaurs, they are not part of this group and represent a distinct lineage of reptiles that evolved flight independently of birds and bats. There are around 100 species of pterosaurs currently known, and one group – including about nine species – is particularly controversial. These are the azhdarchids, a group named after the Uzbek word for ‘dragon’ [image above shows a giant azhdarchid in flight]. With massive, elongate heads, very long, stiff necks, long hindlimbs, and often gigantic size, azhdarchids are more than deserving of their ‘dragon’ title. 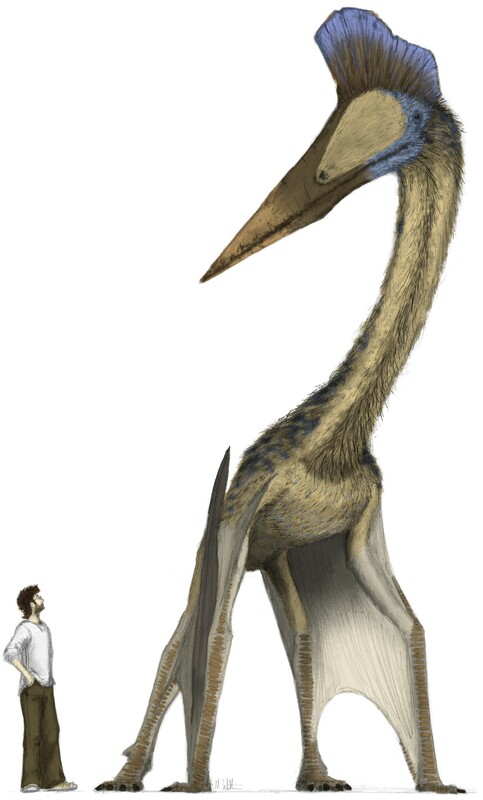 Azhdarchids include the largest of all pterosaurs: some had wingspans exceeding 10 m and, when standing, had shoulder heights of over 2.5 m (see image below, of a 1.75 m tall human next to the biggest azhdarchid – and pterosaur – yet known, the enormous Hatzegopteryx thambema from western Romania. This pterosaur lived during the Late Cretaceous and was named and described in 2003 by Eric Buffetaut and colleagues. It is known from an incomplete skull and some arm and leg bones). Our paper is freely available here. Further information can be found at Mark Witton’s flickr site and Tetrapod Zoology. Wow 🙂 I just love your illustrations. They’re amazing and beautiful and they’ve completely piqued my interest in pterosaurs. This has a very strong ring of truth. I spend hours a day observing the various stabbing birds in south Florida. The do seem to spend most of their time prowling among the shrubbery looking for things to spear. This has greatly stimulated my imagination. I hope to see more activity here…and hopefully some popular books from you guys! I was watching an egret swallow a fish the size of my palm today and wondering how he could do it. I think it’s called inertial feeding. What would be the upward limit on how big an animal this creature could swallow? Given the immense size of the skull in the biggest azhdarchids, it’s reasonable to think that they could swallow large prey… whole. The largest forms had a head 2-2.5 m long, and jaw joints that were about 50 cm apart. This suggests an upward limit on prey of animals about the size of 4 yr old children I suppose. I like to imagine that, like big birds, an azhdarchid would pick up a prey item (say, a big lizard or small dinosaur), throw it to the back of the mouth, and swallow it live. You would then see the prey item move down the neck as a wriggling lump.. niiiiice. Was the beak strong enough to stab to kill likely prey? Strong enough: probably, yes (though this is intuitive as no-one has tested it). But the right shape? Birds that stab prey (herons and anhingas) have laterally compressed bills: in azhdarchids, the rostrum was sub-triangular in section while the lower jaw was dorsoventrally compressed. Based on analogy, this shape is suited for grabbing, not stabbing. I’m still curious about remarks, published elsewhere, asserting that the jaw had special adaptations to allow it to be opened much wider than would be necessary for the lifestyle described. Do you guys have any comments on that? Are the adaptations illusory, or misinterpreted? If not, is there any hint of what behaviors such adaptations might have accommodated? E.g., are there birds (particularly storks or hornbills, but also others with long beaks) that have similar adaptations? I realize that beak opening could have had some esoteric use, such as in mating display. That’s always the easy out, so I don’t like to assume it. *Note that Rynchops is very often misspelled. There is only one ‘h’, and it sits in the ‘chops’, not the ‘Ryn’. Hmmm. I find this quite confusing: it seems to me that they’re saying the gape of Quetzalcoatlus vindicates skim-feeding, right? Well, if I’ve read it correctly, then the response to their hypothesis is almost certainly ‘no’. For one thing, there’s nothing special about a 52º gape and, if anything, it probably evidence against skim-feeding. It seems to me that, without a kinetic skull (the premaxilla of Rynchops can be raised considerably – more so than other larids – without opening the entire jaw), a mandibular trawler (which is how we should imagine pterosaurs to skim-feed, should they have done it at all) would want a wider gape than 52º degrees to clear the premaxillary tip from the water surface, and this is doubly-true for azhdarchids, where the skull/neck articulation means the head naturally faces downwards. Mind you, increasing the extension of the jaws decreases any ‘articularly cushioning’ of a skim-feeding impact that a less-extended jaw may have: when Rynchops hits something, its jaw is opened somewhat by the impact (hence all the big jaw muscles to stop it opening too far). The last thing a skim-feeder would want to do is extend its jaws as much as possible: the moment it hit something, it would risk dislocating it’s jaw. And, before anyone asks: no, the little articular ‘peg’ of Quetzalcoatlus would not stop disarticulation in a skim-feeding impact, and this feature is not seen in any other azhdarchid, anyway. So, to cut a long story short: azhdarchids don’t appear to have hyperextendable jaws and what’s written about their jaw articulation suggesting a foraging method is just confusing and probably bogus. I may draw up some figures and post them on the blog to make this clearer at some stage: watch this space. Thanks, Mark. I guess I missed listing the ultimate disposition: not so much illusory as delusory. I agree that 52 degrees does not amount to much of a gape, and seems only a little wider than necessary to maximize vocalization amplitude (or to engulf a parachutist). On Thursday biking to work I saw a great blue heron by the Ottawa River. I stopped to watch for a bit and inside of 30 seconds it had plunged its head into the water and came up with a 15cm fish (looked like a perch). I couldn’t tell if it was impaled or grasped. It quickly gave the fish a flick that tossed it up just a bit and swallowed it. Obvious what I was thinking as I watched it. That’ll probably be the birding-while-commuting highlight of my year. Last year the highlight was the wild turkey that strode across the bike path just in front of me so I had to hit the brakes. They’re surprisingly big, at least to me. Sadly, two girls were looking at it, wondering if it was an eagle. When I told them it was a turkey, they looked at me in disbelief (a look I get a lot in bike gear anyway), thinking I’m sure, that it couldn’t be because it bore no resemblance to rotund birds they’ve seen in the grocery freezer chests. I regularly see Canada geese, those intercontinental pests, and their young on the way to work. I’ve long thought they looked like dinosaurs (miniature, two-legged brachiosaurs mostly) and thanks to the work of paleontologists who’ve figured out that birds are dinosaurs (and SV-POW! showing their pneumatic similarities with some of the largest of the dinos), it has an even more immediate feel. Biking to work and seeing dinosaurs all around. How cool is that? Of course, what I’d really like is to get to go biking through the preserve where Mark keeps the pterosaurs he draws from life. Fascinating work. If their habitat did not include sea-side cliffs, I’m puzzled about how these huge creatures managed to take flight. It’s difficult to imagine they were strong flappers. What do you propose they did when targeted on the ground by a predator? They seem to be adapted for walking, but could they get a running start? 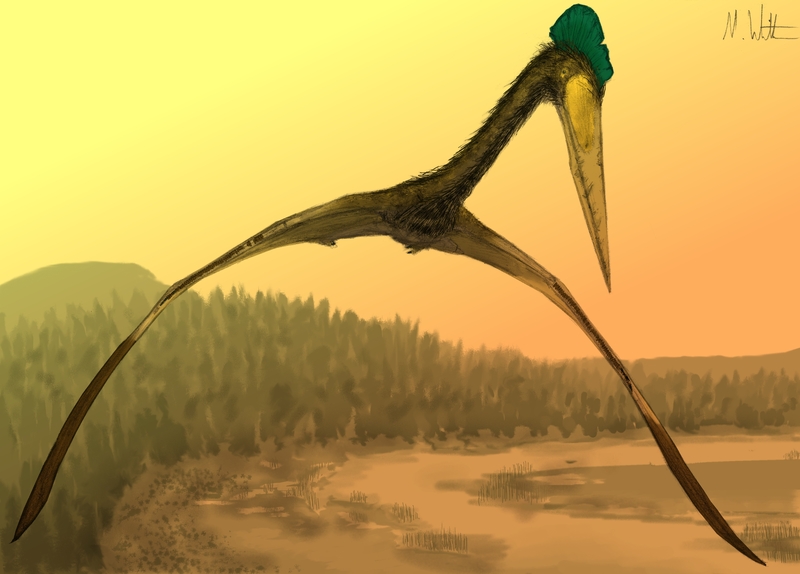 Despite the huge size, azhdarchids could have taken off from the ground, and quite rapidly, IF they used all four limbs to launch (that is, leaping from all fours, rather than just the hind limbs). The evidence for a hind limb launch has actually never been particularly strong (it got rooted simply by tradition), while evidence is mounting rather rapidly for a quad launch. Under a quad launch model, Quetzalcoatlus and Hatzegopteryx could take off from a standstill, from level ground. No cliffs required. Also of interest, azhdarchids have several osteological characteristics associated with expanded flapping capacity. While the flapping would be limited to short bursts, it was probably quite powerful. This makes azhdarchids classic “flap-gliders”: animals capable of short bursts of powered flight, that cover long distances primarily through soaring. Re stabbing, and swallowing whole, I reckon a prudent approach would be to at least mortally wound, or stun, anything that has teeth and claws before you swallow it (in case it fights back injuriously or even breaks out ‘on the way down’; I read a gory story when a kid, pure fiction or not I don’t know, about an eel that escaped its heron predator by biting its way out once swallowed). So it may have paid azhdarchids to give a hard disabling peck or so before picking up sizable prey, or to grab it then kill in the bill (maim or suffocate by biting, expiry through shock, or striking prey against surroundings). As an aside… is it for certain what azhdarchids ate, and may plant items have been at least part of their diet – as with foxes and bears? That’s BIGGER than a T-Rex…! I think the idea of animals killing their predators from the inside stems much more from “dungeons and dragons” than observations of real animals. Various birds, reptiles fish and amphibians all swallow live prey all the time wihout any ill effects. The heron and eel story sounds very fanciful as eels have tiny needlelike teeth designed for seizing prey but not slicing it open. Turkeys have such a strong gizzard that they have been fed handfuls of surgical scalpel blades and suffered no ill effects from them and eventually they corroded away. Some birds like the roadrunner and shrike will beat a small snake or lizard to death before ingesting it, but this is due to the prey being quite large compared to their body. Herons, cranes, and storks simply seize and swallow small vertebrates with impunity, to include sharp toothed snakes and rodents. There was an incident of a pelican in a London Park that simply seized and gupled down a struggling pigeon. I have little double Azhdarchids would feed on proportionately larger prey like juvenile dinosaurs with no ill effects, with no need to expend unneccesary energy trying to kill or stun them first. Was there a difference between some azhadarchid bill tips and others? Were some dorsoventrally compressed, and others quite sharp? And what taxon is considered the most primitive azhdarchid? Is Huanhepterus included among them? Typo: Make that, Mark, not Mike. The last blog I read was from Mike Habib. My mistake. I would say that the more correct verb would be spear. Herons, anhingas and cormorants (perhaps others, but these are the ones I am familiar with)have a cervical vertebra that is usually kinked back towards the body. When the bird sights prey, muscles snap that vertebra forward, propelling the head very rapidly towards the prey. Some of these guys spear their prey, others grab. While beak shape might be an indicator of behavior, I would think that an examination of the cervical vertebra would be more telling. My reconstruction work on the skeletons of _Pterodactylus_ and _Rhamphorhynchus_ strongly suggests that at least these two species were incapable of such an action. Do we have azdharchid cervical series that are sufficiently complete to say how their necks worked?